A report by The Institute for College Access & Success (TICAS) found that nearly 70 percent of 2013 college graduates had student loan debt averaging $28,400, up 2 percent from the 2012 average. Student loan payments are just one of the realities for college graduates entering the real world and trying to figure out the whole budgeting-your-life thing. Leader in the business of all-things personal finance, Intuit shares that transportation should account for no more than 10 percent of your net income, which might not seem like much (especially if you’re just out of college and making a not-so impressive salary), but you can still have a nice and reliable car if you exercise due diligence in the decision-making process. The following tips will help guide you. We all know car commercials; the best ones are those that advertise brand new sports cars with reasonable monthly payments you can actually afford. But after reading (or hearing) the fine print, you learn that the low payments are to lease the vehicle, not buy it. Well then, should you just lease? Monthly payments are typically lower when leasing and the advantages don’t stop there if you’re the type of person who likes the idea of a new car every three years. This sounds great, especially since new vehicles depreciate in value as soon as you leave the lot (by 9 percent according to Edmunds). Then after one year of owning the vehicle, its market value drops to 81 percent. Thus buying a new car is a bad investment on the surface, right? Well, not in the long-run. Owning a vehicle means no monthly payments and lower insurance premiums if you decide to switch from full coverage to liability. Modern cars, particularly Honda and Toyota models, are known to last well into the 250k mile range and even higher with proper maintenance. Leased vehicles also have mileage limits and, upon the end of the lease, you are responsible for any damage deemed excessive to normal wear-and-tear by the dealer. The 2015 Auto Financing Report by personal finance social network WalletHub found that interest rates on both new and used cars are lower than they’ve been in several years. But not all loans and interest rates are created equal. New cars provide peace of mind: you are the only owner, so no secrets as to where it’s been and, should something happen, you have a warranty to cover most major mechanical issues. Auto loans underwritten by the manufacturers had interest rates 35 percent below the average and financing via credit unions had rates 25 percent below the average. National and regional banks offered rates at or well-above average in most cases. Used cars are, of course, less expensive and have already endured the bulk of value depreciation, which happens in the first few years on the road. Financing a used car is also much easier in most cases and much like student loans have income-based repayment plans, there are financing companies like DriveTime that offer customizable payment plans for all budgets. Used cars typically have lower insurance premiums and you may even be able to negotiate a used car warranty if you know your options. 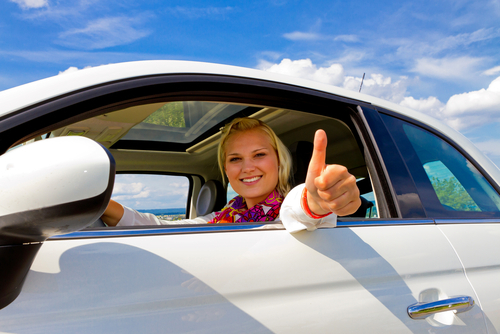 If possible, purchase a certified preowned car that has been thoroughly inspected by the manufacturer. Some used cars companies offer third-party extended warranties, but make certain you thoroughly understand the terms before paying extra for it. A subprime auto loan, those underwritten for customers with FICO scores of 650 or lower, is something to avoid altogether. To put it in perspective, a $20,000 four-year auto loan with a 3 percent prime rate will cost you only $1,248 in total interest. That same loan at an 18 percent (subprime) rate will cost you $8,200 in interest . Obtain a copy of your credit reports from the three major bureaus. Your payment history and amounts owed on open accounts make up 65 percent of the aggregate FICO score. Pay down credit cards that are at or near the limit to quickly improve your score. It’s best to pay down/off the oldest accounts first, as length of credit is also factored into your score. A minimum credit score of 700 should be the goal before considering an auto loan at all. The test drives and haggling with salesmen are the fun parts of buying or leasing a vehicle. Just heed all the aforementioned to get the best deal and make the right decision for what you need and what you can afford. Going to college? Order your copy of The Secrets of Top Students today!